Ivory Coast has formally inaugurated President Alassane Ouattara in a ceremony delayed for more than six months because of violence and turmoil after his predecessor refused to step down. United Nations Secretary-General Ban Ki-moon and French President Nicolas Sarkozy were among the more than 20 dignitaries and heads of state who attended the event Saturday in the capital, Yamoussoukro. 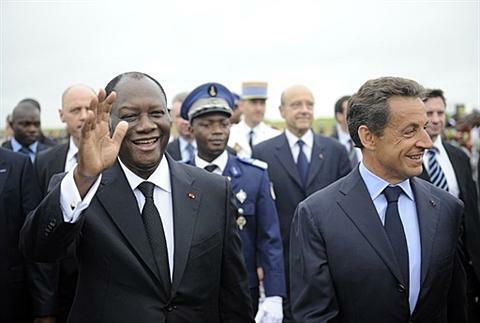 As he arrived Saturday morning, Mr. Sarkozy said he felt it was "important" for "democracy" and for "Africa" to be in Ivory Coast, a former French colony, for the ceremony. Although Mr. Ouattara was sworn into office earlier this month, Saturday's ceremony marks a symbolic new beginning for the West African nation after more than a decade of instability, a rebel uprising that split the country in two, and repeatedly postponed elections. Violence broke out again after last November's presidential vote, when President Laurent Gbagbo, in power since 2000, refused to accept his election defeat. At least 3,000 people were killed in the fighting. Human rights groups accuse supporters from both sides of killing and injuring civilians in the battle for power. Mr. Ouattara now faces a difficult task of fostering national reconciliation, restoring security, and of holding accountable those responsible for atrocities in the post-election violence. President Ouattara has promised justice for all victims of the post-election violence, saying there will be no exceptions. On Friday, the International Criminal Court appointed a panel of judges to investigate the violence. The U.N. Security Council has extended its peacekeeping mission in Ivory Coast until the end of July.